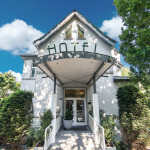 The Hotel Waldhaus Langenbrahm lies in the midst of a quiet forest in the green south of Essen. 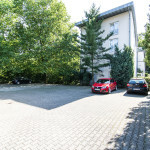 The Messe Essen, the Aalto-Theater, the Folkwang Museum, the Villa Hügel, the Gruga and the Baldeneysee, a wonderful spot of nature with high recreation value, are attainable within 5 to 10 minutes walking distance. The boulevard, department stores and businesses are likewise closely located. A golf course, a tennis court and a jogging road are only a few minutes distant. Formerly the Hotel Waldhaus Langenbrahm was the residence of the director of mining. Today the bright and friendly house is well-known for its calm location with forest view, its styleful ambiance with an international flair and the personal full service by numerous guests and friends of the house. We are there for you on 365 days every year. 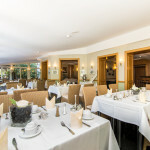 After an eventful day we would like you to feel here as at home and recover in an exclusive however relaxed atmosphere. In our cozy wine bar serves a small, fine selection of Palatinate wines. Beyond that we offer a wireless internet access in all hotel rooms as well as in the reception hall. Due to the large demand the majority of our rooms are nonsmoker rooms. 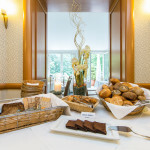 The smell of fresh coffee, warm rolls and croissants is in the air… After a wonderful night you start out into a bright new day at our extensive breakfast buffet, which does not leave desires open to you. 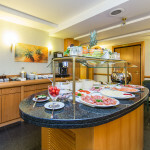 For tea connoisseur we have a big selection of “Ronnefeldt” tes at our breakfast-tea-bar. On inquiry we offer gluten-free and lactose-free food. 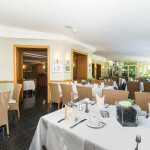 At sundays and on holidays we offer a relaxed long breakfast till 11:00 o’clock. We provide parking lots at no cost for our hotel guests.